Digital Works is our programme of events which brings people from across the arts, cultural, heritage and creative sectors to share best practice around digital. We hear stories of success, lessons learned from failure and discuss and debate new and emerging techniques, services and products. Content, and particularly content design, is something I feel the cultural sector hasn’t been curious enough about (there are, as ever, notable exceptions) so it seemed like an obvious topic of discussion when I began planning Digital Works #7. I first encountered the idea of content design when I read Sarah Richards’ (excellent) book (which I now recommend to everyone). Sarah was the first person to describe content design as a discipline, when she was at the Government Digital Service. The idea of taking a user-centred, measurable, needs-driven approach to content was something that seemed very sensible to me. Continuing our run of ‘royal’ venues it was exciting to be able to host DW#7 at the Royal Academy of Arts in the historic Life Drawing room – huge thanks to them for being such welcoming hosts and in particular to the lovely Mike Harris who sorted everything out for us. The 150-year old room was extraordinary, featuring (amongst many other things): a giant sculpture of a flayed horse, a real human skeleton and the cast of a condemned man who had has his body donated to the arts after he’d been executed. 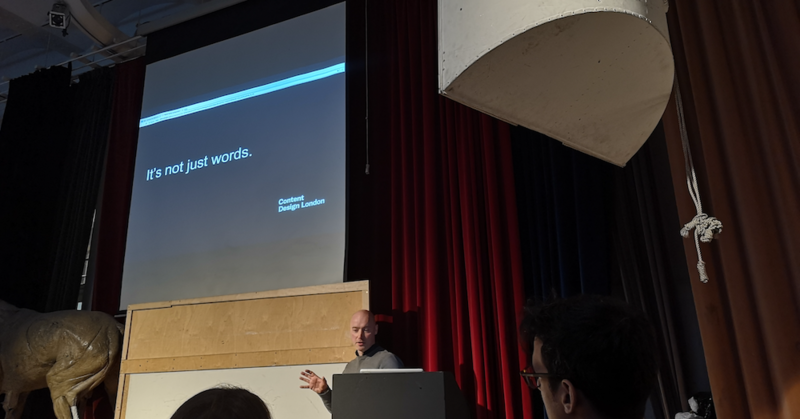 I was really pleased to be able to bring together three speakers at Digital Works #7, each bringing a different and valuable perspective on the opportunities and challenges presented by this really quite different approach to thinking about and ‘doing’ content. Nigel Jones worked with Sarah Richards at the Co-op and now works for her Content Design London agency, he is currently working on a project with Her Majesty’s Prisons and Probation Service (HMPPS). Christina Hirst is a Senior Content Strategist at Cancer Research UK, she and her team are embedding content design (and all that entails) across the entire charity (the biggest in the UK). Louise Cohen is Head of Digital Content at the Royal Academy of Arts, she would speak about the RA’s experience developing and implementing a content strategy over the past 2 years. It’s always interesting trying to describe the ‘format’ of Digital Works to someone who hasn’t been before. Whilst, yes, there are ‘normal’ presentations as you’d see at any conference, we also try to thread in the opportunity for meaningful discussion and peer-to-peer sharing. This sometimes gets a bit unwieldy but is also consistently the element of the event that receives the most positive feedback. So it was great to have three speakers who wholeheartedly, and generously, embraced this idea and approach and a bunch of lovely attendees who were happy to get stuck in and share their thoughts and experiences. Nigel kicked off the day with a potted history of how content design has developed as an approach (you can hear a bit more about the origins of the approach in this interview with Sarah Richards). The shift from a ‘command and control’ approach to producing content (“I write it, you spell check it and maybe get to make very minor changes, then get it published”) to the more collaborative, informed, considered approach that content design requires is something I believe pretty much everyone could benefit from. Ultimately you are moving from a very risky “this is what we think/assume/want people to consume” to something that is rooted and comes out of actual user needs and user requirements. Giving people what they need (as Nigel said, “it’s user needs not user wants“), in a way they will find it easy to locate and consume seems like a no-brainer. Nigel shared his experience of delivering a content design project in prisons. Producing content that was useful and meaningful for prisoners to consume whilst they were incarcerated, sometimes produced by prisoners, about the things that prisoners said they needed to know about aimed to improve prisoner/staff interactions and try to make prisons a safer and more productive place. It was really inspiring to hear about the work Nigel and his team are doing. I think the potential parallels with some of the outreach and community work that I know so many arts organisations deliver seemed clear. Discussions then centred around some of the challenges that people anticipated they might encounter if they looked to adopt this approach. There seemed to be two clear areas of difficult that were highlighted. Firstly, the issue of engaging with ‘subject matter experts’ in a way that got them involved without alienating them or making them feel undermined. Secondly, the challenge of aligning project goals and priorities around business objectives. Christina talked us through how she and her team have been introducing content design principles at Cancer Research UK. Again the topic of dealing with subject matter experts came up; it was interesting to hear of the success Christina has had getting colleagues with very specific audiences (e.g. scientists and politicians) on board with the idea of content design as an approach. She particularly focused on introducing plain English, pointing to CRUK’s use of tools such as Hemingway and the internal ‘writing for the web’ workshops that her team runs on a regular basis with every department. It was clear that CRUK fully embraces the idea of constantly testing everything they do. This ranges from structured work in their UX lab through to quick, informal conversations about their work with colleagues and the public. They also use online tools such as Usability Hub (which is one of the tools I’ve written about previously). This method of a clear, considered approach user needs and language; consistent and regular support and training to get buy-in from colleagues; and ensuring that testing and feedback is baked into everything they do looks to be yielding really significant results at the charity. You can download Christina’s presentation deck here. We rounded out the day with a session from the RA’s Head of Content, Louise Cohen. Now, Louise didn’t mention this – because she’s too modest, but her team have won awards for their work so it was great to be able to hear about the thinking behind their approach, and also to get a frank insight into the challenges they’ve faced (and how they dealt with them). 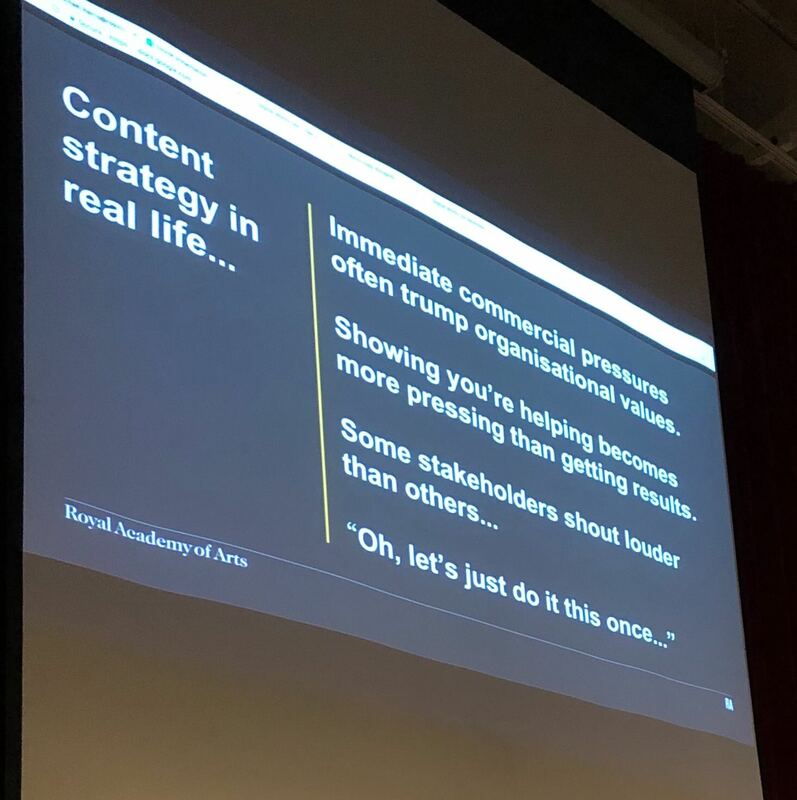 It was interesting to hear about the structures that underpins the RA’s content strategy, drawing influence from journalism’s approach to content the RA identified new ways to produce and present content for a clearly defined set of audiences – with carefully researched needs and motivations. They also worked with Chris at One Further (our favourite analytics nerd) to create reports in Google Data Studio that allowed them to measure their new activity against specific KPIs. This gave her and her team a level of clarity and focus around what was, and wasn’t working, that they hadn’t previously been able to achieve. Louise took a specific look at the #lifedrawinglive project that they delivered towards the end of 2017. A beautifully simple idea, conceived from the outset to be truly digital, in a way that recognised and responded to its audience. It was both moving and powerful to see the outpouring of enthusiasm and gratitude that people had towards the RA for engaging with them in this way, and Louise encouraged us all to recognise when we make this sort of impact rather than just getting buried by the day-to-day grind. The Q&A which closed the day ended on a lovely discussion focused on being kind and generous with the people you work with when embarking on new projects, and trying new approaches. Change is difficult, and challenging, and when you’re in a digital role you can become comfortable with a level of change that other people find threatening and difficult. You can download Louise’s presentation deck here. Having worked in and with arts organisations for over a decade I can see that shifting our approach to content is no simple task. As all of our speakers made clear, content design is a radical change in approach. It is inherently collaborative and iterative, it requires specialists on all sides (not just subject matter experts, content design itself is a specialism) but it feels like the potential rewards of this approach are significant. What also became clear is that content is never ‘done’, and for us to be able to produce the best possible content, that is most meaningful to our audiences, and most valuable to our organisations, we need to drive a shift in culture. Simply developing a strategy isn’t enough, the hard work of achieving buy-in and working with colleagues to embed the changes required to make your strategy a success can’t be underestimated. But all of our discussions underlined the impact that we can have when we get it right, and that feels like too exciting an opportunity to let pass. Fab afternoon at @royalacademy for the #DigitalWorks07 conference. Thank you to @supernige, @Chrissie__H & @LouiseACohen for your really interesting talks around content design and management. Lots to think about and implement! Digital Works #8 will take place in March or April 2019 (date and location TBC). If you are interested in hosting, speaking at or attending a future Digital Works event please just drop us a line: events@substrakt.com.